There are surf shops and surf schools in Samara but big swells don’t make it into the bay. Earthquakes have lifted the seabed and the reef in Samara. Waves are not what they used to be anymore. No matter what the surf forecast predicts, it is rare that anything over 2 feet makes it past the reef. There are some beach breaks for beginners but nothing noteworthy. The surf schools teach the novices to stand up and ride the white water straight to the beach. For someone who never stood on a surfboard and is a bit afraid, this can be the ideal spot to get introduced to the basics of surfing. There are some outside reef breaks, but they are way outside. This beach is more for swimming than for surfing. Compared to other beach there are no dangerous currents. As a result this beach is popular amongst travellers with small children. The small waves are fast or closeout. Usually conditions do not permit more than one maneuver. 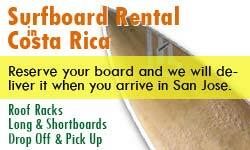 In Playa Samara there are several surf schools and surfboard rentals. Surfers, surf schools and swimmmers share the waves on the north side of the bay. Samara Beach is a nice beach for beginner surfers. The waves do not get big and there are no clean up sets. The waves in Samara are small. You can see the reef in the back of this photo that protects the bay from bigger swells. The water is shallow and the bottom sandy, a beginner friendly surf break.